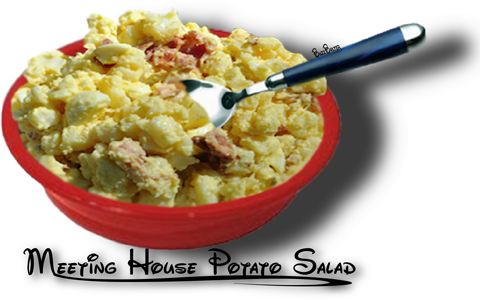 MEETING HOUSE POTATO SALAD - JUST THE THING FOR A CHURCH SOCIAL OR POT LUCK DINNER. An easy to make and absolutely delicious potato salad. ●  1½ pounds unpeeled waxy boiling potatoes scrubbed, I like Yukon Gold. 1. Cook potatoes in water to cover until tender, about 30 minutes. 2. Drain potatoes and cool thoroughly. Peel potatoes and cut into 1-inch cubes. mustard and salt. Pour over potatoes. 4. Add chopped eggs, ham, celery,  shallots, green pepper and pickle relish. 5. Mix thoroughly. Cover and  refrigerate overnight to blend in flavors.